Our winter would be very different this year. We spent about a week in Briare, preparing ‘Aurigny’ for winter and packing for both summer and winter weather. In the New Year we would make our long awaited trip to see Laura in New Zealand. We liked the Commercial Port very much and would be happy to return there one day in the future. 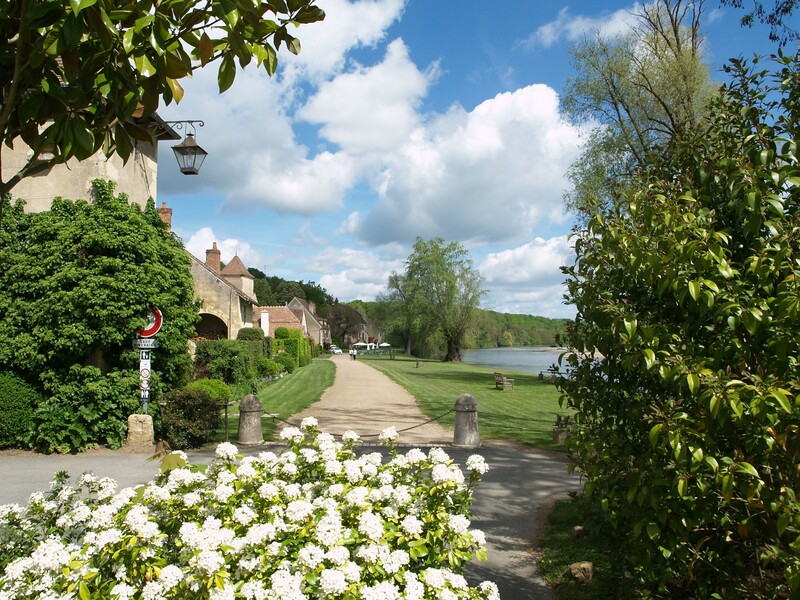 The area has many fine walks along the various canals and River Loire. While we were there, Louise and Alex (Riccall) joined us for a couple of days on their way south and we enjoyed catching up on news. This would be our trusty Micra’s final return trip to England, as we were stopping ‘en route’ in Bruges to pick up Lynn and Stew’s (Matariki) Suzuki Grand Vitara which they had kindly given us when they returned to New Zealand. It was great to catch up with the Bruges ‘bargees’ that evening and kind of Diana and Chris (Esme) to put us up for the night. Back in England, Peter stayed just long enough to get the ‘new’ car ‘MOT’d before returning to Briare. Adam joined him for a few days and helped get the motor cycle off the barge and onto a new trailer Peter had bought- not easy without a fully functioning crane! Meanwhile I spent the time in England catching up with friends and family as usual and singing with the Treble Clef Choir. 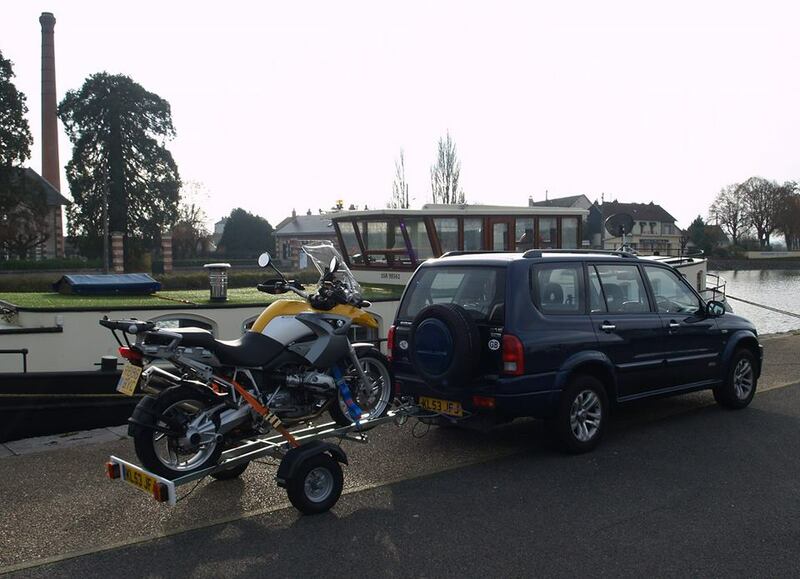 New car with trailer ready for the trip back to the UK. We spent Christmas on Alderney and were pleased that Adam could join us there for a few days, enjoying a superb Christmas day dinner with Paul and Jean. This is another lovely place to visit where we have family and friends and of course where the name ‘Aurigny’ stems from. January and February were spent in New Zealand – an amazing experience. It was lovely to spend time with Laura and Dan and we visited many parts of that wonderful country. 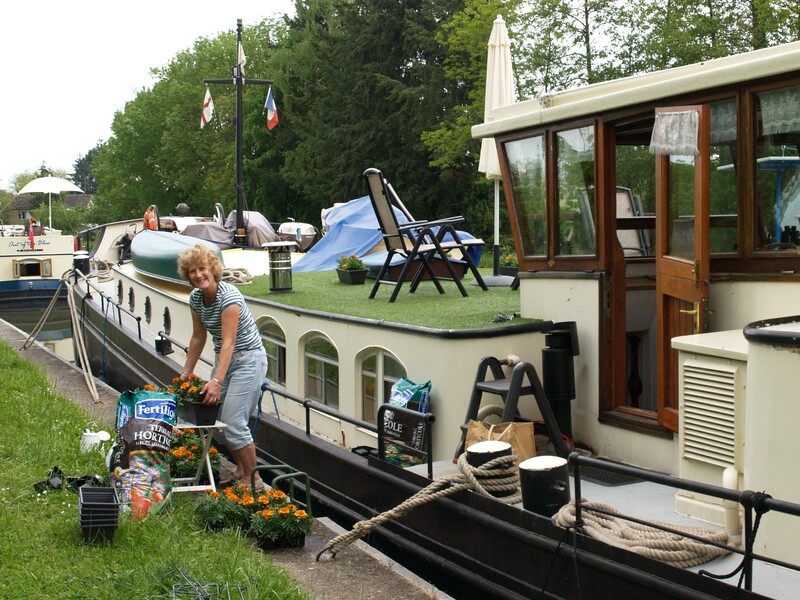 The ‘Long Village’ of the European Canal System stretches across the world and we were lucky to spend time with four couples we have met during our barging travels. Lynn and Stew (formerly Matariki), Lynn and Keith (Paprika), Lorna and Aidy (formerly Ariana) and Rosemary and John (Petronella). We also popped over to Brisbane to meet up with our old friend Dave Hambly and his new family who live ‘off grid’ three hours from that city. Thanks again to all these kind friends who were so hospitable to us. We returned to the Northern Hemisphere in early March and went straight to Devon to see my dad who had been taken very ill after Christmas. After spending two months in hospitals in Surrey, he was well enough to move to a care home near to my sister Kate, just as we were coming back. Peter then returned post haste to Briare, having never left ‘Aurigny’ for so long before. I followed a couple of weeks later. We had about a week for me to get my head back in the barging groove before we set off. Meeting up with friends at the port reminded me of what a great way of life this is. The Pont-Canal de Briare had undergone painting and repair over the winter, but was open again on 1st April. We set of around midday on 3rd and cruised the short distance to Beaulieu where we had stopped last autumn. 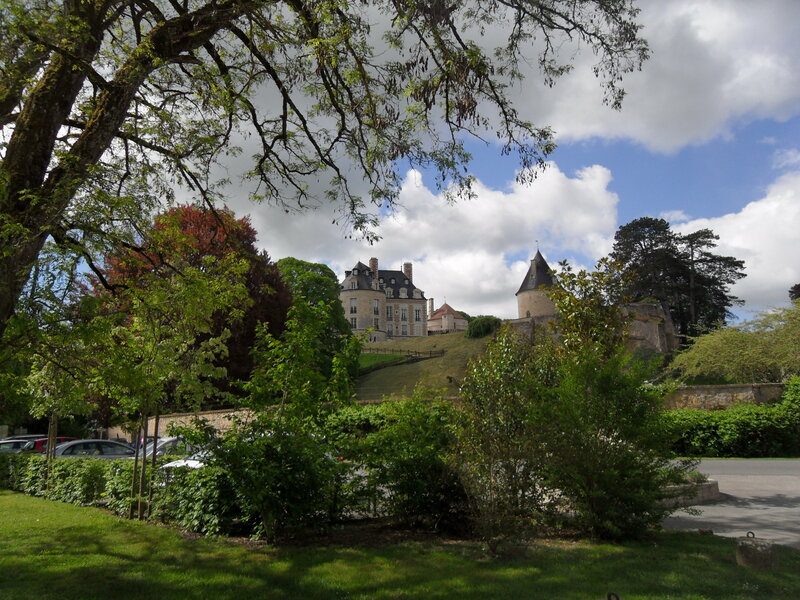 Other familiar stops included Lere and Menetreol-sous-Sancerre. The Loire a Velo cycle route was useful for picking up the car and the bicycle fitted in the back more easily than it had in the Micra. We had decided to crack on with the painting of the barge’s top-sides, having failed to do much last year. Before that however, Peter had the unenviable task of cleaning and rust-proofing a very cramped part of the engine room which hitherto had always been full of water from the propeller shaft. Not an easy job when you are 6’3’’. At Menetreol sous Sancerre, we met Aileen and Mike on their narrow boat ‘Quaintrelle’ as they returned loaded down with wine from a nearby cave. 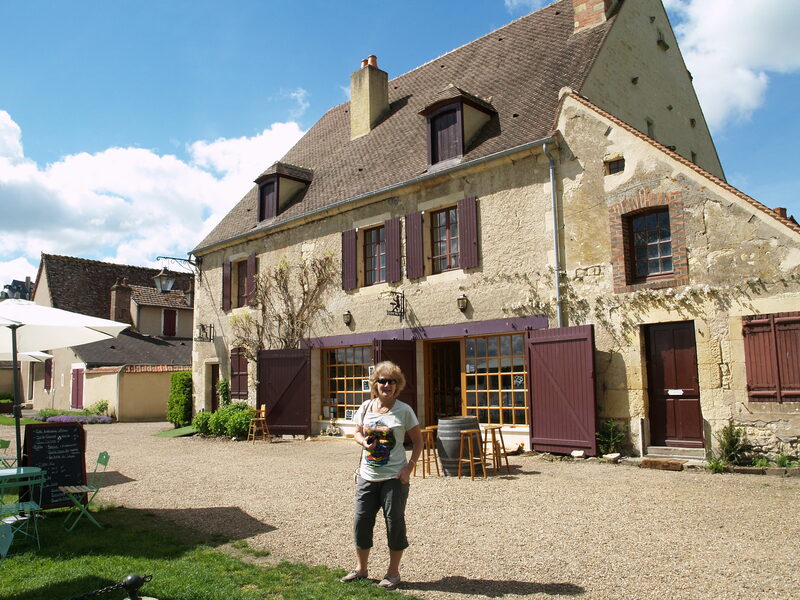 We spent a couple of convivial evenings with them in the nearby ‘Le Florin’ bar and were joined there by Sue and Alan who had caught us up on ‘Whisperer’. Our next stop was another old haunt at La Chapelle Montlinard with its free electrics and water. We set to and cleaned the wheelhouse roof (started last spring) and the front deck/coach roof and crane. Peter finally gave the wheelhouse its long awaited second coat and by the time we left almost a week later, the coach roof just needed a final coat. Paul joined us there and Jane and Guy (Hibou) also stopped for a night. The weather was unseasonably warm and we enjoyed a couple of barbecues. The chaps resumed their boules competition and I had a couple of lovely walks among the fields of rapeseed. ‘Hibou’ left and their place was taken by ‘Jenal’ who were coming north from Roanne to a shipyard on the Seine. 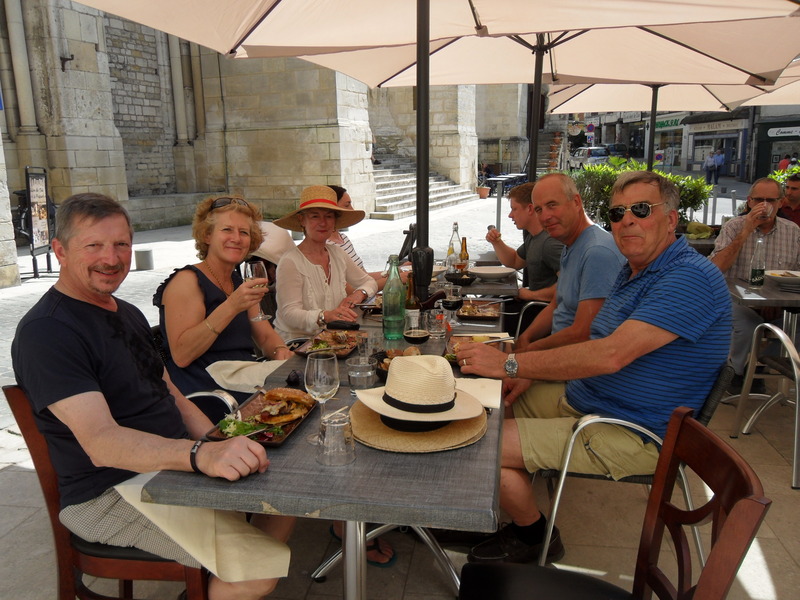 On 20th April, Jenny and Alan joined us for a splendid lunch in La Charite sur Loire to celebrate Peter’s 60th birthday. The bridge repairs we had seen there in October were just about finished, but several roads were still being resurfaced and I drove in circles following the diversion signs while trying to find a supermarket. As ‘Jenal’ left to go north, we headed south and joined ‘Hibou’ at Cours-les-Barres. 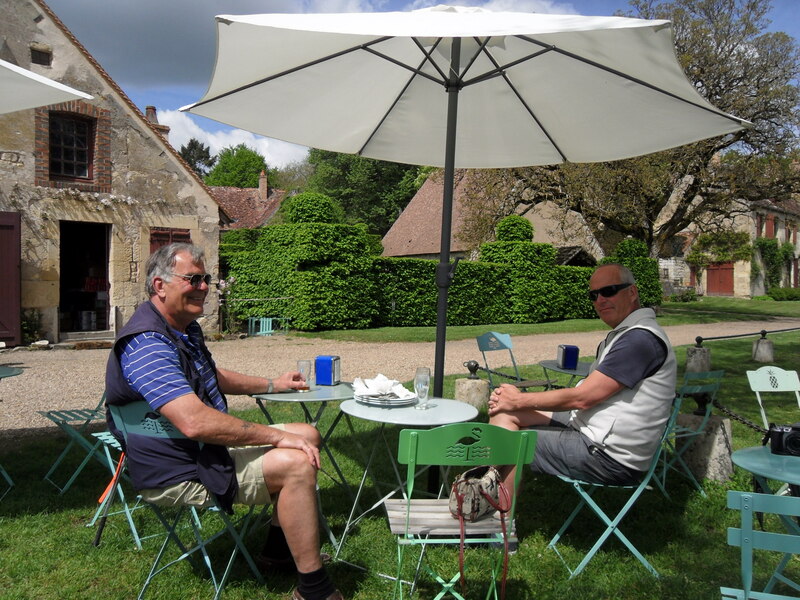 I was kindly invited for aperos with Jane and Guy while the chaps drove back to the very nice boules terrain at nearby Beffes. Apparently the excellent sports facilities in Beffes were paid for by the Nuclear Power Station at Belleville as part of its contribution to the region. Our next stop was the long quay before the Pont-Canal at Le Guetin. This is an older aqueduct than the one at Briare by about fifty years. Peter put the final coat of non-slip deck paint onto the coach roof and he and Paul made some rubber supports for the dinghy and canoe out of an old zigzag glissoir (fender). Front deck painted and new supports for the dinghy. Meanwhile I did two pleasant walks to Le Bec de l’Allier- the junction of the Rivers Loire and Allier. A short drive to Apremont-sur-Allier, a ‘Beau village de France’, made a pleasant outing and a galette at the strangely named ‘Carpe Frite’ went down well with a local beer one lunchtime. With our dinghy and canoe supports stuck in place we could remove both boats from the grass deck and put our deck chairs out. After the spell of very hot weather, the change was rather a shock. 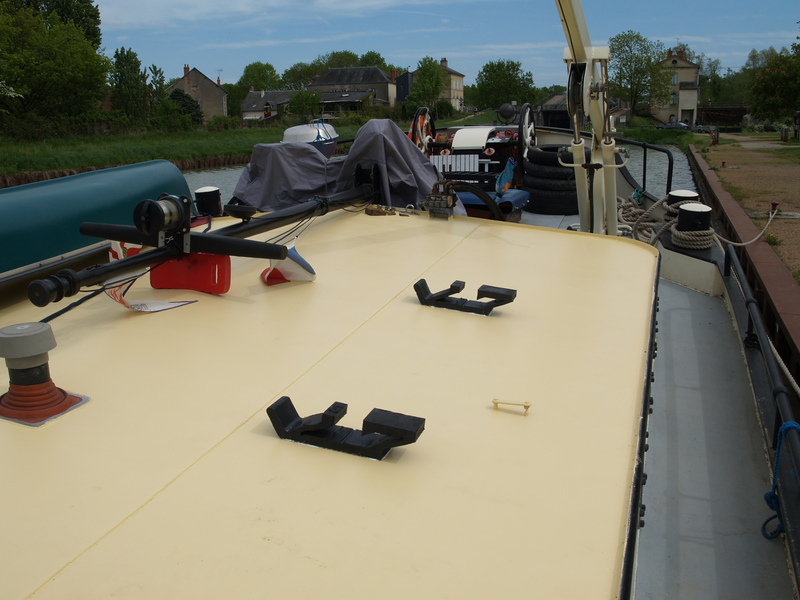 We moored for the weekend at Fleury-sur-Loire and happily paid the 9 euros a night for water and electrics. The washing machine had started leaking and the drum half filling randomly when it was switched off, so the lounge was now the repository for the contents of the airing cupboard. Fortunately we cured the problem with the aid of some lime-scale remover down the inlet hose and found and repaired another leak caused by a loose fitting in the airing cupboard. We were fast approaching familiar territory at Decize. 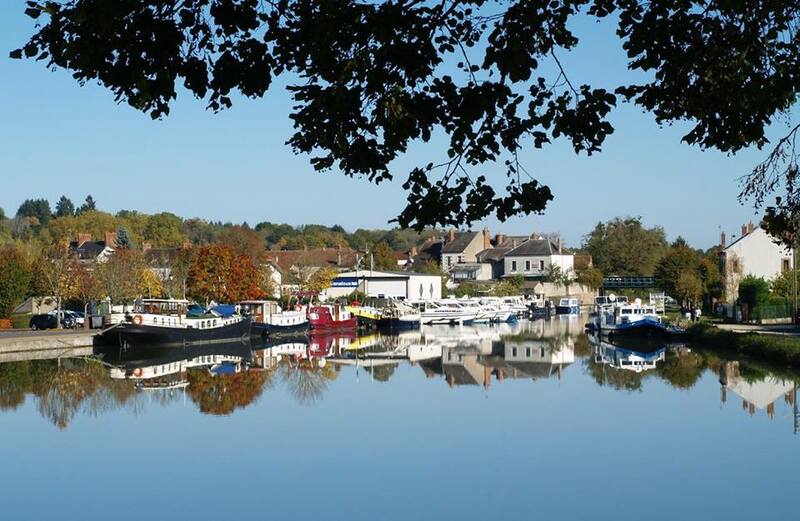 In her past life as ‘Captain’s Lady’, ‘Aurigny’ had spent over a year in the port at St Leger des Vignes, at the start of the Canal du Nivernais. In fact she was there when we first saw her in 2009 and we spent our first winter there. This time we were approaching from the Canal Lateral a la Loire. We drove over to see if our old neighbours Maureen and Ron were on ‘Dimmis’, but sadly they weren’t, so returned to Fleury and hunkered down to watch the Grand Prix just as the rain came down. 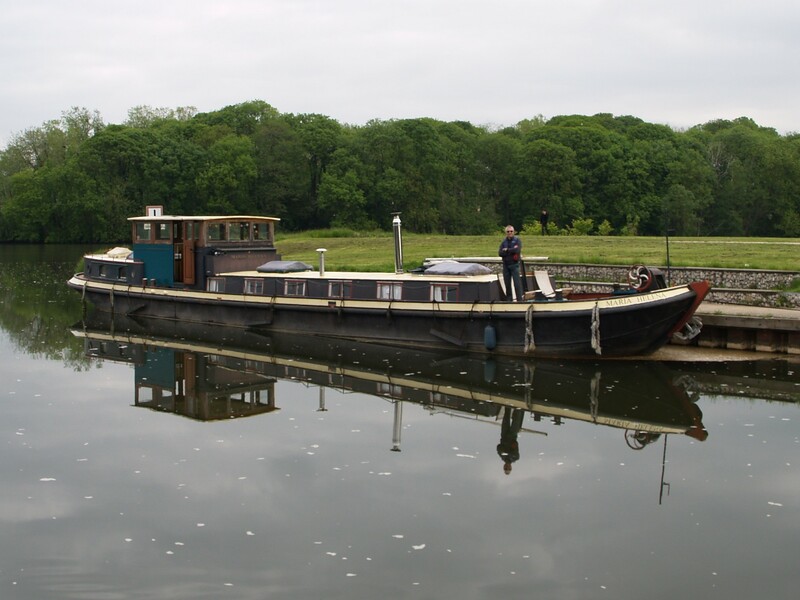 At this point Peter told me there was a barge asking for help via The Barge Association (DBA) online forum – ‘Maria Helena’ was stuck on a quay on the River Loire between the two canals at Decize. She had a broken engine. Understandably, her owners who were back in the UK dealing with another crisis were desperate to get her to safety and effect repairs. The Loire has a tendency to flood quite dramatically at short notice. We drove down again to see her and decide whether we would be able to assist. 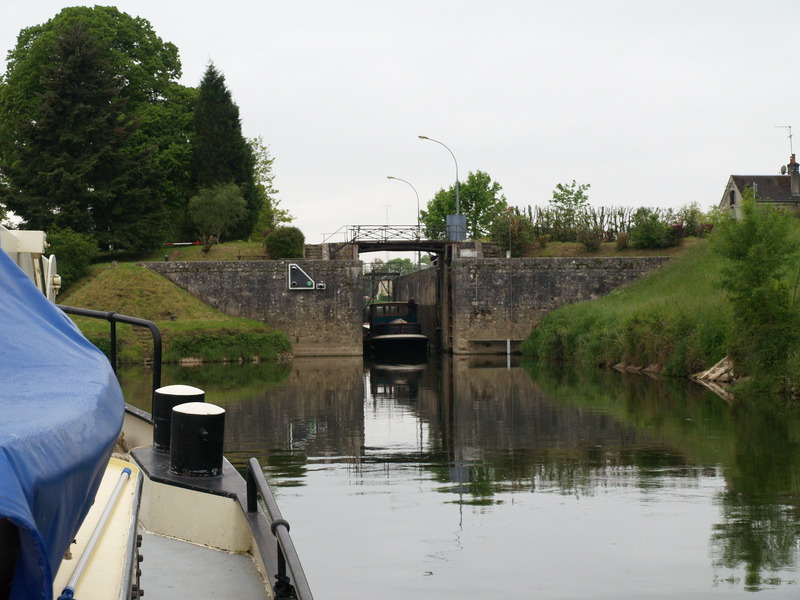 On Monday, after cruising most of the day, we stopped on the Canal Lateral above the port of Decize. We walked down to the Loire and found another quay on the same stretch of river, which although flowing quite fast, looked okay. 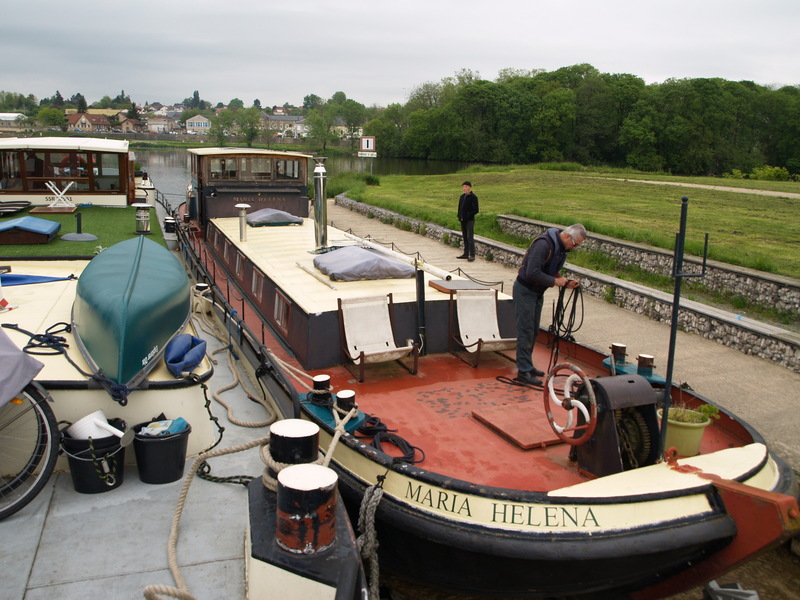 Back onboard, we headed though the two automated locks onto the Loire and moored up with ‘Maria Helena’ in sight just a quarter of a mile downstream. 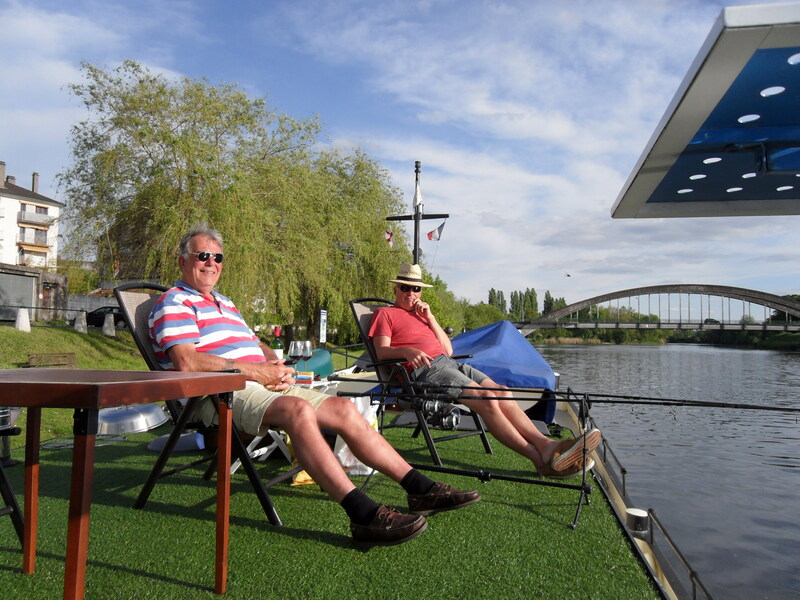 Despite my worry about the potential dangers of being on the Loire, the mooring was lovely and we stayed a couple of days. This enabled Peter and Paul to hatch a rescue plan and ‘Maria Helena’s’ owners Ian and Pauline to fly back out. 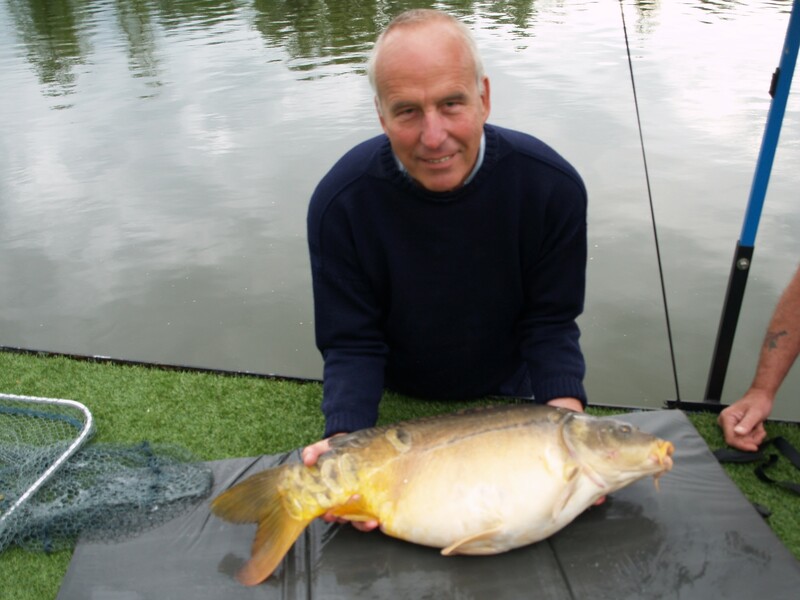 Peter loves rivers and was delighted to catch a huge carp on the first evening. The following day was May Day and all the locks were shut. Not bad for the first fish of 2018. Ian and Pauline arrived early evening the next day and joined us for a barbecue. We reconvened at 8am and drove to the first lock for a briefing. 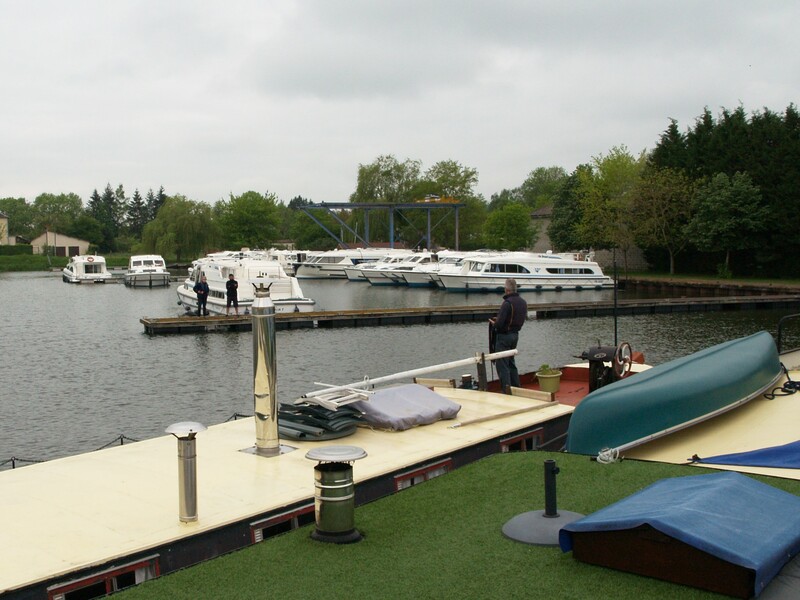 Paul and Pauline were to remain bank side to take ropes and manoeuvre ‘Maria Helena’ into the lock. Three and a half hours later, with ‘Maria Helena’ safely moored in the port, ‘Aurigny’ returned to the canal, Peter reversing into a space made for us by ‘Hibou’ who had caught us up again. An impromptu aperos evening ensued, with Jane and Guy and also John from a narrow barge moored with us. Then Ian and Pauline arrived on their tandem, bringing wine, champagne and a jigsaw puzzle as a thank you gift. All’s well that ends well and we were pleased to have been able to help. ‘Maria Helena’ awaiting a tow. Rafted up we set off upstream to the lock. 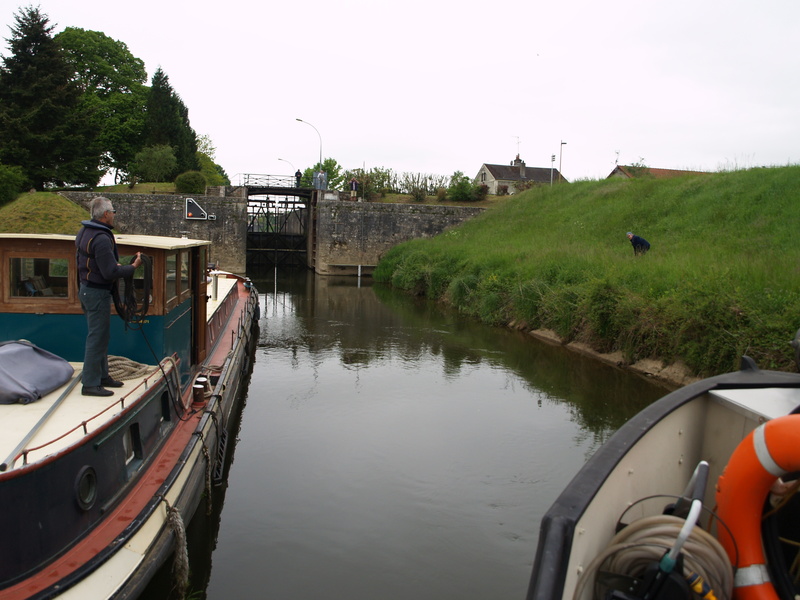 At the lock and out of the main stream we separate and hand over to Paul and Pauline. I would have preferred to raft on the starboard side but the strong current made it difficult for a changeover. We trip the lock activation and with a pull and a push in she goes. On the other side we raft up again and manoeuvre her onto the pontoon. 2 Responses to 25. Endings and beginnings. Well done helping ‘Maria Helena’ and wonderful to fill in the story with pictures! Thanks Ian, happy to help.